A kimono jacket is a type of loose throw-on which is not supposed to be zipped or buttoned and usually is either left loose or fastened with a belt like the original kimono. You’ve probably seen it thousand times but just didn’t know that it’s called this way. 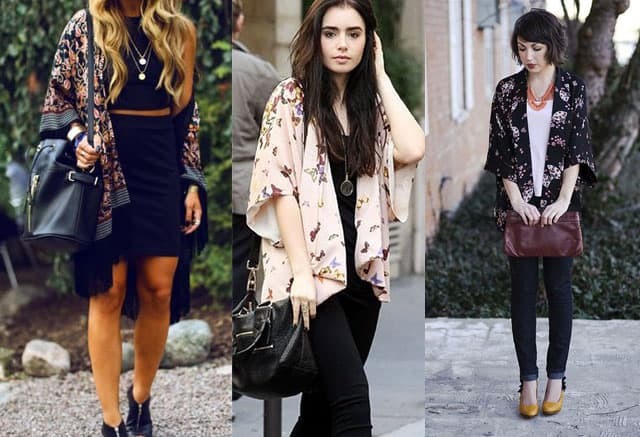 Well now you know and it’s time to find out everything about ways to wear kimono jackets for both casual and fancy looks. If you’re not sure about what to wear with a kimono jacket use these combinations to feel café and confident having tried on this new style. 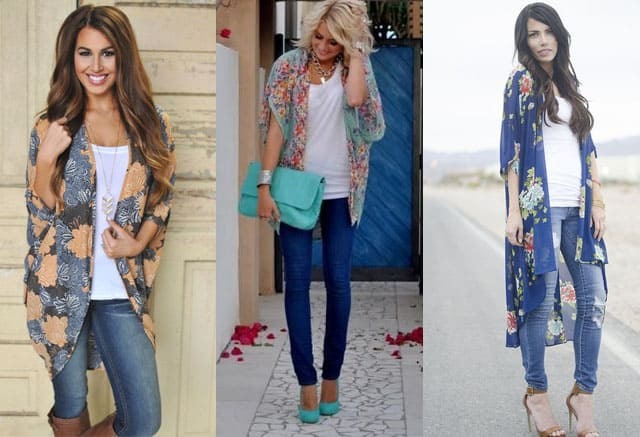 Kimono jacket outfits are a relatively new trend so they look best with other clothes that are in fashion now: buy a broad-brimmed hat, a crop top and a high-waist skirt or jeans along with the jacket and you’ll get an integral look most people wouldn’t dare to wear. Because of the amount of stylishness of course. 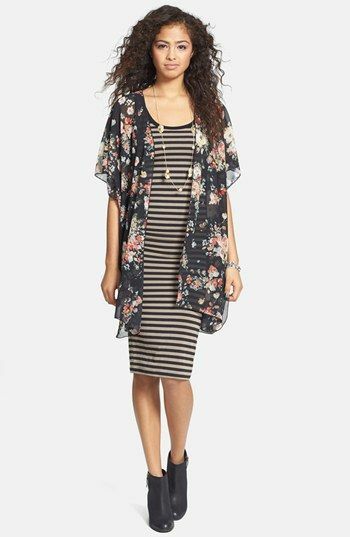 If you think of other options onhow to wear a kimono jacket just find a dress which accentuates your waist: it’s no good when all the clothes in the ensemble are loose so the dress just has to be either tight or just belted for a feminine look. 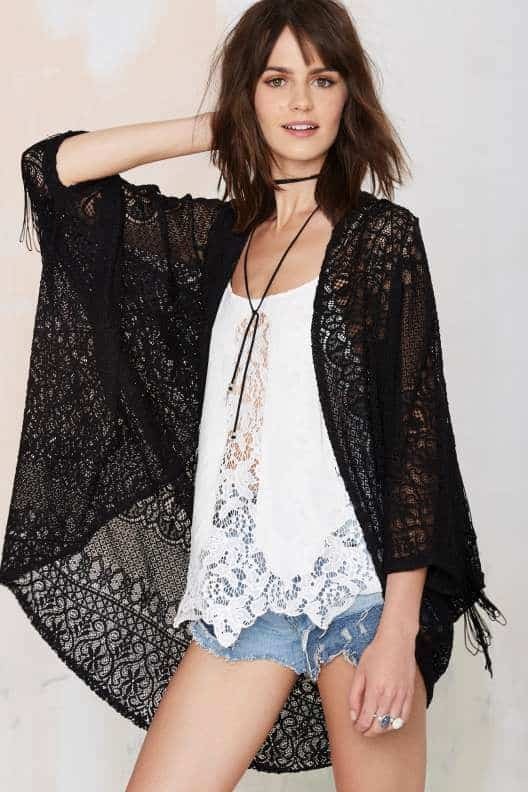 The length can also make a difference: cute outfits with kimono jackets usually feature either middle length or short skirts and dresses and almost never include really long ones, especially if they’re circular or gypsy. In case you aim for a tomboy look instead try tie-dye shorts, a tank top and either a semi-transparent or jersey kimono with a decadence print on it. But the problem is kimono jackets add like 50% to your feminine side and it’s gonnabe tough to play it down. You might succeed in doing so if you go for slip-ons, biker boots or sneakers instead of sandals and pumps. These heavy weight kimono jacket outfit ideas will probably become a breath of fresh air regarding your office dress code cause they can replace blazers just perfectly. If you find the right color and cut you’ll look way milder than all those fancy suited business ladies do, which we believe is a good thing after all. Pair your jacket with a formal dress, a pencil skirt and a turtleneck or a blouse and a pair of classy pants. As for footwear you should definitely go for heels in this case. It’s unbelievable that something this universal and simple can come in handy as femininity booster, yet you can see that even the plainest outfits get a charming twist after you add a kimono jacket to it. Tip: If you want to look laid-back don’t belt the jacket and on the contrary if you wanna bring out the curves and look neat and womanly use it to show off your waist and femininity. When you hear “kimono jacket” you probably imagine something that looks like a geisha’s robe and some of the options you can find in stores actually do look a bit like this. Asia inspired ornaments and prints, light fabric, loose sleeves and trimmed sides will surefire give out the origins of the piece unless it has been modified to look less Japan-like. Heavy weight kimono jackets will both keep you warm and comfy when it’s cold and serve as a nice unusual fashion blazer. Considering all the prints and appliques they come with the process of choosing one you’ll like the most will last for hours. They all look so adorable! 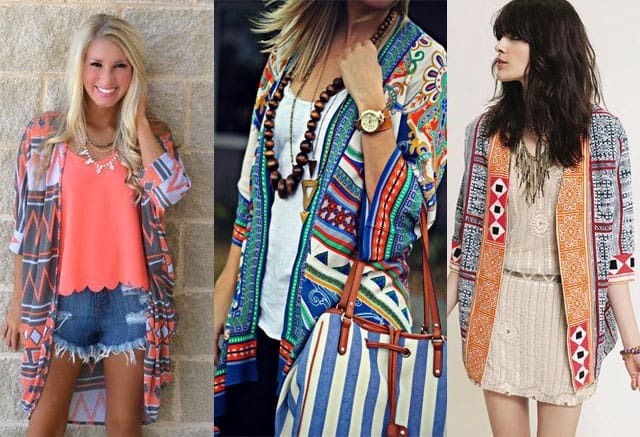 Jersey kimono jackets are usually a bit longer and they seldom have exquisite prints or other embellishments. 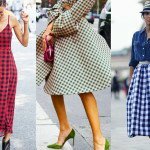 That’s why they’re mostly used as a throw-on with rather casual clothes like denim shorts and a T-shirt or a plain short summer dress. Chiffon and silk kimonos are super lightweight and are perfect for beach parties and summer walks protecting you from getting sun burns. Hooray for the kimonos! 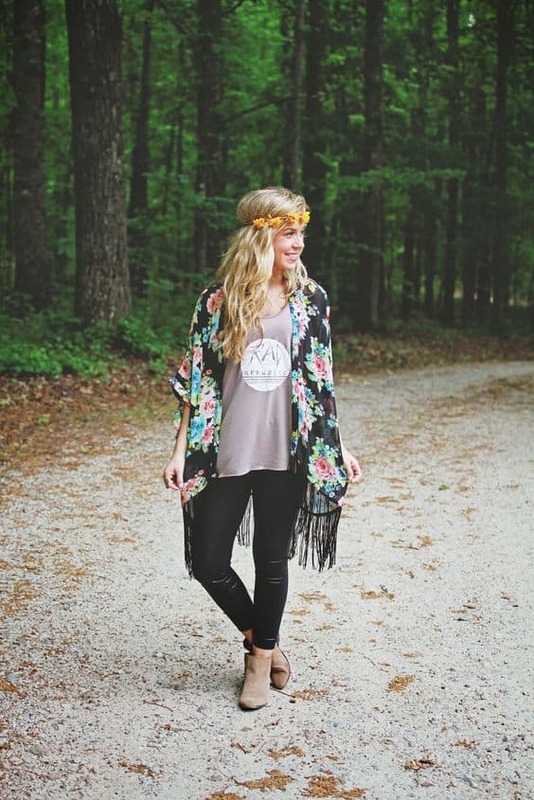 Black floral kimono jacket with fringe and black skinnies. Romantic and cute image. Red kimono jacket and black shorts with black ankle boots of course, this image gives some eastern charming and mysterious , which is inherent to women of the East.